Here’s the official iOS 10.3 beta 1 release notes and changelog, showing what’s new in latest iPhone and iPad beta firmware according to Apple. So, you may have heard the news by now! Apple has officially provided developers with access to the latest pre-release seed of its mobile operating system iOS 10.3 beta 1. Not only does it give something for said developers to test their own software against, but there’s also generally new features and functionality for those individuals to try out, and of course, feedback directly to Apple with any bug reports or improvement suggests. We’re going to take a look at what’s new with iOS 10.3 beta 1, as designed by Apple’s own changelog, or release notes if you prefer. One of the first thing’s that’s identified by Apple’s release notes is the fact that engineers have made some changes, and hopefully improvements, around the Find My iPhone service. The iCloud-based service now supports Location and Play sounds for Apple’s latest premium accessory, the Apple AirPods, meaning owners can opt to play an alert function directly through a set of Apple AirPods, but only from the device that was last used with those AirPods. Sticking with iCloud, there’s also some amends around how users are presented with iCloud Analytics during a device set up procedure. Apple has also released a note with the changelog advising of a potential error message being received when attempting an iCloud Backup. In addition to these changes mentioned, iOS 10.3 beta 1 doesn’t really contain anything substantial and exciting to get your teeth into. 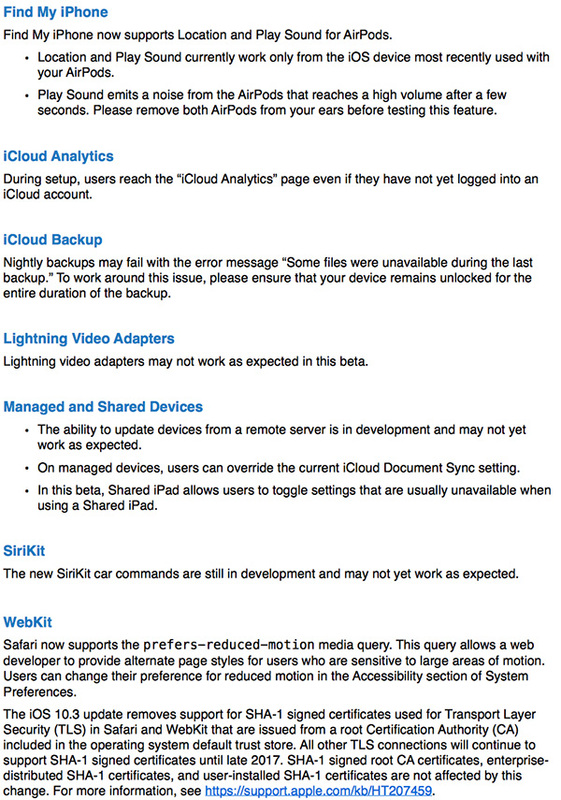 There’s breaking changes to Lightning video adapters with Apple’s admission that they may not work as expected, as well as an admission that newly released SiriKit car commands in 10.3 aren’t exactly in perfect working order, and may not “work as expected.” Welcome to the world of initial betas. Interestingly, the expected Night or “Theatre” Mode which was rumored and has been talked about so widely in recent weeks has yet failed to make an appearance. We’ve been seeing a number of leaked images and assets suggesting a Apple is about to introduce a Dark or Night Mode into iOS, as well as a suggestion that a new “Theatre Mode” could automate the dimming of the display and setting it up to watch media on the device, but so far there’s no sign of it in 10.3 beta 1 release. However just because it isn’t in beta 1 seed of 10.3 doesn’t mean it isn’t going to make an appearance in subsequent pre-release builds. Lets hope it makes an appearance in future beta releases of iOS 10.3. 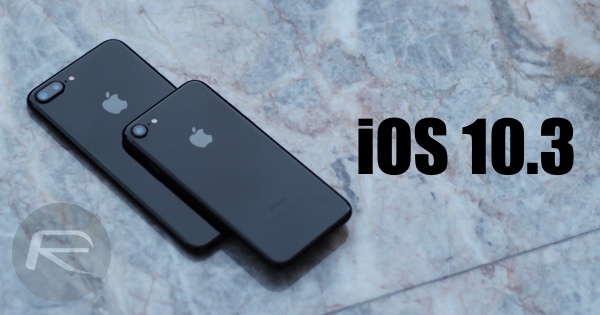 Update x1: And here are all those features that we have found so far in iOS 10.3 beta 1 seed: iOS 10.3 Beta 1: All Changes And New Features In One Place.